Ever wonder how our doctors see inside patients? Most people think X-rays or CT scans. 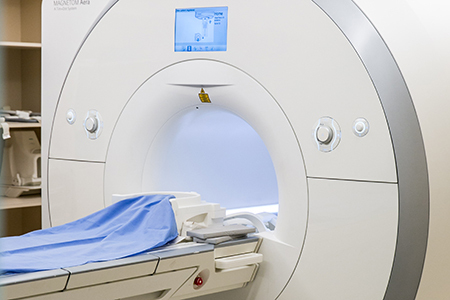 But those can’t help physicians visualize the properties of various tissues like Magnetic Resonance Imaging (MRI) can. MRIs allow radiologists to see the unseen and discover the unknown. They reveal the body’s tissues in exquisite detail. Every day at Trillium Health Partners, MRIs scan our patients for diseases that include breast and prostate cancers, brain disorders, spinal cord injuries, among others. MRI images account for many of the nearly 650,000 diagnostic scans performed each year at our hospital. Demand is rising exponentially from all of our medical departments because of our rapidly growing and aging population. Our MRI machines are approaching the end of their useful lives. With new machines we could achieve faster scan times and improved resolution. Proceeds from Golf Classic 2018 will help purchase a new MRI machine for our hospital. Your support will continue to keep our patients within our circle of care — our magnetic field of care — closer to home.